Fancy designs and trim are fine, but when it comes to FR workwear, aren't you really looking for basic designs that deliver functionality and safety? That's what you get when you choose this Wrangler Men's Grey FR3W10G Riggs Flame Resistant Lightweight Work Shirt. ... (see full details) (see specifications) #FR3W10G. Fancy designs and trim are fine, but when it comes to FR workwear, aren't you really looking for basic designs that deliver functionality and safety? That's what you get when you choose this Wrangler Men's Grey FR3W10G Riggs Flame Resistant Lightweight Work Shirt. When you are work near fire and flames, safety definitely comes first, and this Riggs shirt delivers. This professional men's shirt meets NFPA 2112 requirements and NFPA 70E, ASTM 1506 and OSHA Rule 1910.269 standards. It's rated HRC2, ATPV 9.5 CAL/CM2. Crafted of 6.5-ounce lightweight 88% cotton and 12% nylon FR sateen, this shirt combines the comfort of cotton with flame-resistance for on-the-job protection. Nomex (FR) thread is used in all the garment seams. You can machine wash it at home -- be sure to follow care instructions with the garment. Although you'll probably buy men's top for its flame-resistant protection, you'll love the fit, too. It's styled in a relaxed fit for comfortable wear all day long. The back features a straight yoke for a good fit. Delivering easy-going, no-nonsense style, this lightweight long-sleeve design features a button-down collar that works with or without a tie, two-button adjustable cuffs, and a chest pocket that includes a pencil slot for convenience. There's a distinctive Riggs FR label on the chest pocket, and for additional safety, the design includes a Safety Orange outside ID for high visibility. If you are looking for FR protection in a lightweight and easy-going style, this Wrangler Men's Grey FR3W10G Riggs Flame Resistant Lightweight Work Shirt delivers straightforward design and flame-resistant. Order yours today from the workwear specialists right here at Working Person's Store. 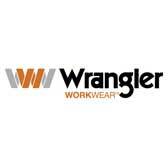 Wrangler Shirts: Men's Grey FR3W10G Riggs Flame Resistant Lightweight Work Shirt is being added to your cart.